This is a recipe for almond flavored Raspberry Bars. 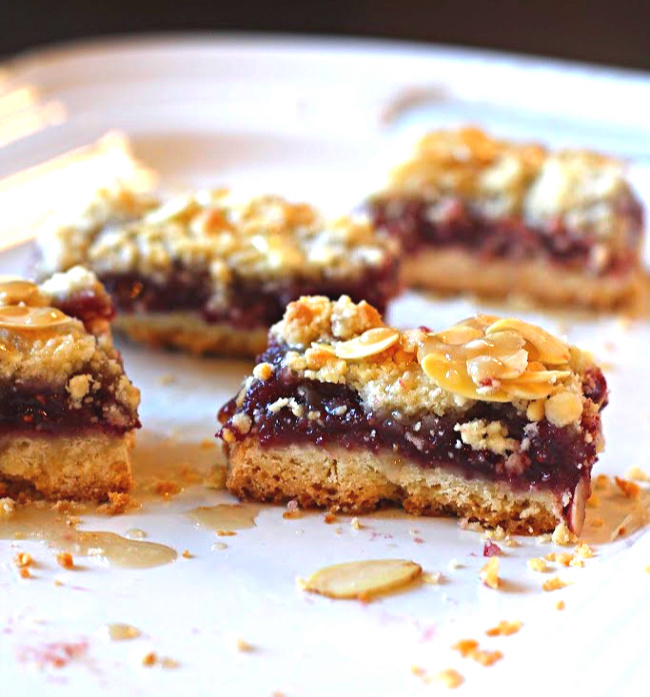 These raspberry dessert bars are made with raspberry jam, Chambord liqueur and are complimented by slivered almonds and a buttery almond flavored short-bread type crust. An easy recipe year round, but with the deep red color of the raspberry jam. especially nice for Christmas or Valentines Day. Don’t you think holidays are always better with a special dessert treat? And how easy does it get to use raspberry jam to make these delicious and easy dessert bar. It’s a great dessert recipe to feed a crowd. And did I mention that the crowd went wild? There’s something about the almond and raspberry combo that simply works. And with Chambord liqueur added to compliment the raspberry preserves, you’ve got an even more mouth watering combination. With a shortbread crust as the base and slivered almonds on top, you most certainly could call these raspberry crumble bars. Raspberry crumble bars that melt in your mouth and have you reaching for another…and another. And what about that crowd? A couple of weeks ago, our son Sean invited us over to his studio for a Christmas ornament making party. He pre-molded and provided us the ceramic snow flake, and we spent the next couple of hours hand painting our own designs onto the snowflake. This is the second year he’s done this and it’s great fun. Last year we painted Christmas stockings. Let’s just say I was less than pleased with my result, so hoping the snowflake turns out a bit more “professional.” A Christmas ornament I will be proud to hang on our tree. And with any gathering that involves our family group, of course there’s food involved. At this pot luck affair I took my award winning chili, my friend Holly’s recipe for gluten free Hermit Bars and these raspberry bars. Sean provided his New Mexico style turkey chili, made absolutely delicious using New Mexico chile powder. Cauleen brought two kinds of cornbread. We enjoyed a delicious dinner before we went to work. 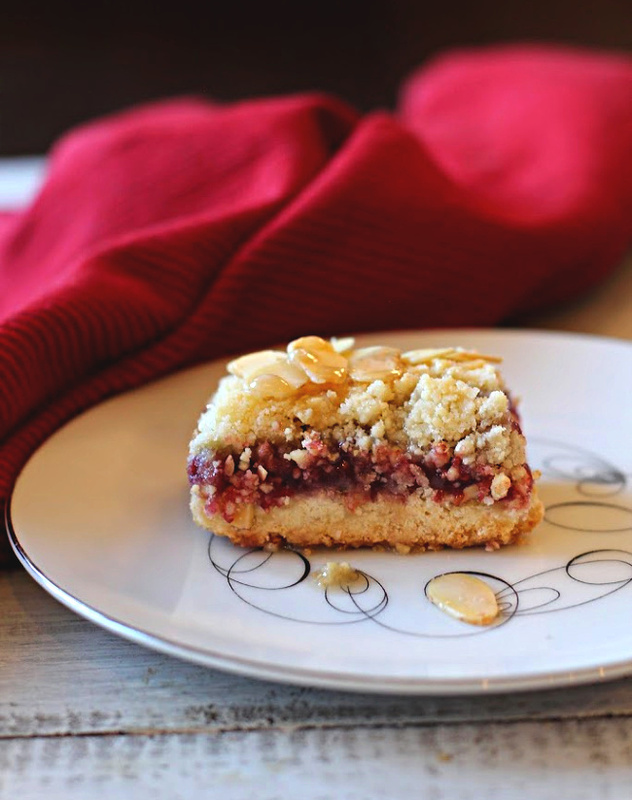 These raspberry bars are very easy to make, just a few simple steps and they’re done. Using a food processor, combine flour, powdered sugar and butter. Pat it into a casserole dish and bake. The filling is even easier, just combine the Chambord and the Raspberry Preserves. The topping is a mixture of flour, sugar, almond paste and butter, again mixed in the food processor. Sprinkle on those beautiful sliced almonds. After another bake, a simple glaze of powdered sugar, milk and vanilla brings this all together as a delicious dessert treat. Can you freeze raspberry bars? Yes, just wrap them well in plastic wrap or place in an air tight container. 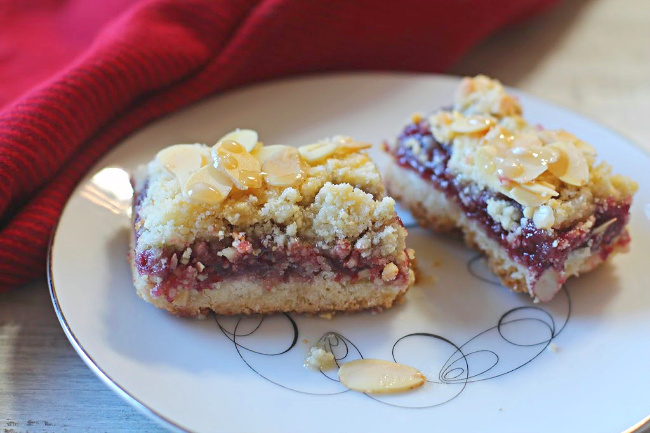 I hope you give this Almond Raspberry Bars recipe a try and if you do, please come back and give the recipe a star rating and leave a comment about your experience with the recipe. And if you have a favorite raspberry bars recipe please let me know, I’d love to give it a try. This is a recipe for almond flavored Raspberry Bars. 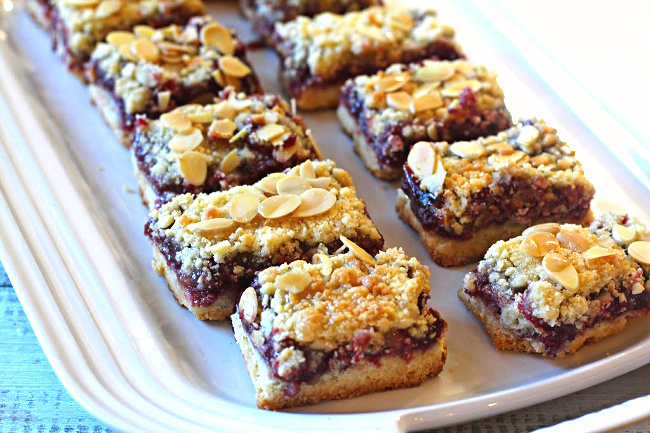 These raspberry dessert bars are made with raspberry jam, Chambord Liqueur and complimented with slivered almonds and a buttery almond flavored short-bread type crust. An easy recipe year round, but with the deep red color of the raspberry jam. especially nice for Christmas or Valentines Day. Preheat oven to 350 degrees. Combine all crust ingredients in a food processor and quickly pulse until crumbly. Pat crust into a greased 13 x 9 x 2 inch glass pan. Bake for 20 minutes or untill ight golden brown. Remove from oven. For filling: Mix preserves and Chambord liqueur together and spread on top of crust. To prepare topping: Combine flour, sugar, almond paste, and butter in a food processor and quickly pulse until crumbly. Sprinkle over filling and top with sliced almonds. Bake at 350 degrees for about 40 minutes or until golden brown. Filling will still be jiggly, but will set up as it cools. Cool in the pan on a wire rack. Stir together all icing ingredients until smooth. Drizzle icing over the bars while still in the pan. Cool completely in refrigerator before cutting into bars. Use a very sharp knife. These bars can be hard to cut. I have found a very sharp serrated knife cuts through the almond topping without the almonds flying all over the counter. Oh yum! 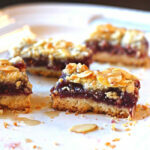 I’ve made Ina Garten’s recipe for jam bars and your addition of liqueur really makes these a step above those! I’ll have to give it a try. Btw, I am so glad the hermit bars worked out for your young friend. Thanks for sharing a link. Pinned and yummed. Whoa, these sound amazing! I love raspberry bars and adding Chambord kicks these up a few notches! I love this kind of bar and they sound delicious with the Chambord! Lea Ann, these gorgeous bars would go perfectly with a cup of black tea! I first had or heard of Chambord when someone gave me a bottle of it at my bridal shower (back before the earth cooled!). I don’t like to drink it, but I love to put it in things, so this is going on my must-make list! A beautiful bar cookie for the holidays or anytime of the year. Merry Christmas. Those look delicious! I love that Sean hosts a Christmas craft party. What a great idea! Merry Christmas to you and Bob. So I’m assuming 12 tablespoons of butter in the crust? Actually you need 16 Tablespoons. Oh my these were sooooooo good. I didn’t even want to share these with our dinner guests. This will be my go to for dessert from now on. Thank you so much Marilin! So glad you liked them and thanks for letting me know.